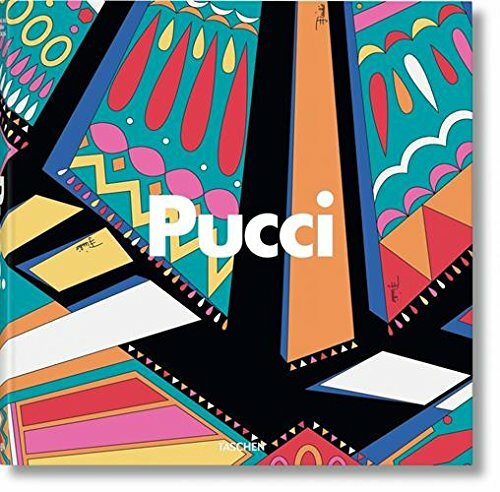 Emilio Pucci is not only a limited edition book, but also a comprehensive study of one of the world’s greatest, yet under-appreciated, international designers of the 20th century. This exquisite volume traces the history, both personal and professional, of this iconoclastic Italian designer who broke the barriers of fashion as well as those of his regal lineage. In a 400-page paean to Emilio Pucci, even the most seasoned fashionista will learn that Marquis Pucci was ahead of his time when it comes to many of the unimaginable trends that would materialize during the last part of the 20th century and into the 21st. The genius of this designer is described via quotes of his clients, family, fellow designers, and some of the most influential fashion editors of our times. One cannot overlook comparisons to the well-known greats such as St. Laurent, nor can one ignore the brilliance that might have influenced a young Philip Treacy or possibly even Giorgio Sant’Angelo. The Marquis was prolific and saw the future of sportswear long before we did in the USA. His sense of color was unparalleled, and yet there is no red in the kaleidoscopic vocabulary of Pucci. He saw silhouettes, fabrications, accessories, and manipulations that would not gain popularity for many years to come. There were “coolie hats,” capri pants, wrap waists, spandex, caftans, harem pants, technologies, body suits, scarf print shirts, embroideries—and most of all his prints. It would be difficult to pinpoint any one designer who might have been “the originator” of so many trends that would come and go during the 60 years that followed the start of the Emilio Pucci design philosophy. Keep in mind that Emilio Pucci explored every aspect of fashion and was a pioneer in the brand-extension empires that came later during the second half of the 20th century. He had handbags and jewelry and hats, ski wear, intimate apparel, home fashions and fabrics, and even uniforms. And keep in mind that his notoriety has lasted for over 60 years with no sign of abatement—a legacy that few can boast of in the annals of fashion history. Rarely can one recommend ownership of such an exquisite volume, but in this instance there is beauty here for anyone who might have the slightest interest in fashion as well as for the most devoted fashionista or fashion historian.